First off, I got my copy of the book via a giveaway hosted by Goodreads. This was a fantastically enchanting novel geared toward middle-school aged youth. Hope, determination, and love lead 3 siblings through a scavenger hunt adventure around the country and even out of it at one point. 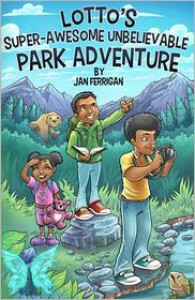 I can see this book inspiring some children to ask their parents to take them camping or to a national park in the summer. In this age of electronics many of us (even adults) forget how much good a little fresh air and good ole family bonding time can be for us.